Many of us don’t consider how important the humble pallet is in terms of handling, storing and shipping goods. They literally travel the world many times over, transporting a range of goods. They’re an integral part of the global economy, reducing shipping costs and enabling goods to be easily and quickly moved from one place to another. The pallet has its origins in the late 19th century, when it became a popular method of transporting the first mass-produced goods. Modern-day pallets were developed from wooden ‘skids’ which were used to move goods between the shore and ships. They were similar to those used today, but without a bottom board. The use of the wooden pallet really took off with the invention of the gas-powered forklift truck in the 1930s and following the Second World War. During the war they were used to effectively transport supplies to troops across the world. At the end of the war there was an abundance of pallets across the world and they’ve been developed ever since as an efficient method of transportation. Today there is a choice of a wooden or plastic pallet and both have advantages and disadvantages. Due to the influx of the Asian long horn beetle, which can be disastrous for trees, wooden pallets must be heat-treated before they can be used. Plastic pallets are considerably moore expensive than wooden models. However, with the growing demand for products that meet individual specifications, plastic is becoming a more popular choice. It can be easily moulded to specific requirements and lasts considerably longer than wood – between 10 and 20 years more. How Important Is the Pallet? 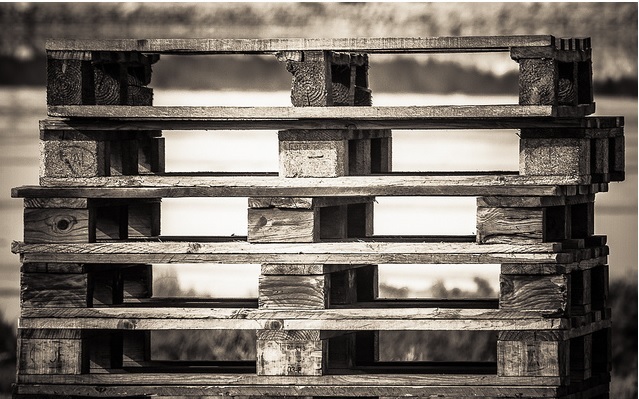 It might only be a simple wooden or plastic construction, but the pallet is a vital component in the shipping industry. It’s used across the supply chain – from the initial supplier through to the manufacturer, distributor and finally by the store. They allow more goods to be fitted into a smaller space, such as a container or lorry, which means that fewer journeys need to be made. This reduces the cost of manufacture, as well as limiting the impact on the environment. As goods are stacked easily and safely on to the pallet, they will arrive at their end destination in excellent condition. The secure base is essential for stacking and means that even heavy goods can easily be loaded and unloaded with the use of a pallet. Often products are even designed with transportation by pallet in mind and are made to fit perfectly into the space. Using a pallet is also a much better option in terms of the health and safety of workers, including drivers and warehouse operatives. It allows goods to be quickly and effectively transported from trucks on to racks, without the need for any manual lifting. A forklift truck can effortlessly carry the load and move it to wherever necessary. It might appear cheap and simple, but without the pallet it would take considerably longer and be much more expensive for goods to be transported across the globe. It truly is a great invention that’s become of huge importance to the global economy.